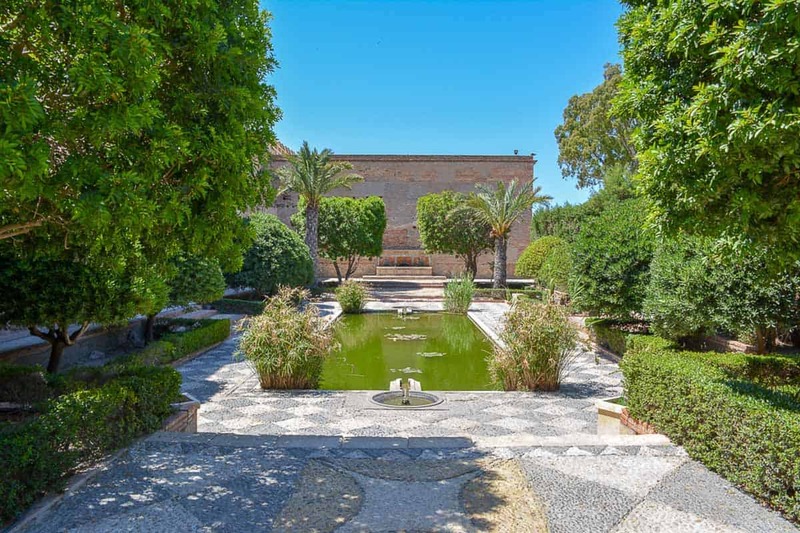 There are many good reasons why you would want to visit the Alcazaba in Almería. First of all, it’s big in size. In fact it’s the second biggest Moorish fortress in Andalusia after the Alhambra. Secondly, it offers some fantastic views of the coast and the city. 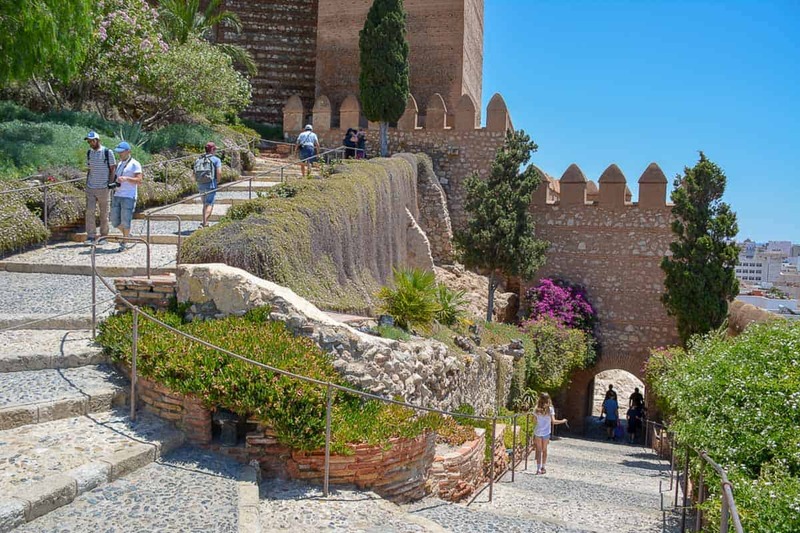 Lastly, the Alcazaba with its many ruined structures and gardens is a story-teller which offers great insights into the history of Andalusia. Enough reasons for me to visit this castle. But there is one last one for me: Before we leave Andalusia after having lived in Malaga for a year and a bit, I want to see the fabled Acazaba of Almería with my very own eyes. It is, after all, one of the top things to do in Andalusia, and it hadn’t been ticked off the list until now. Let me tell you of our experiences before I will anwer the question you may have whether I think you should visit the Alcazaba as well. Every castle visit in Andalusia needs to be earned the hard way, by climbing the stairs to reach the top of the mountain. This is no different in Almería. Alcazaba, this means fortress in the Arab language. It’s a common term in the south of Spain, where the Arabs ruled the Iberian Peninsula the longest. You will find one in Malaga, one in Antequera, and one in Granada, for example. 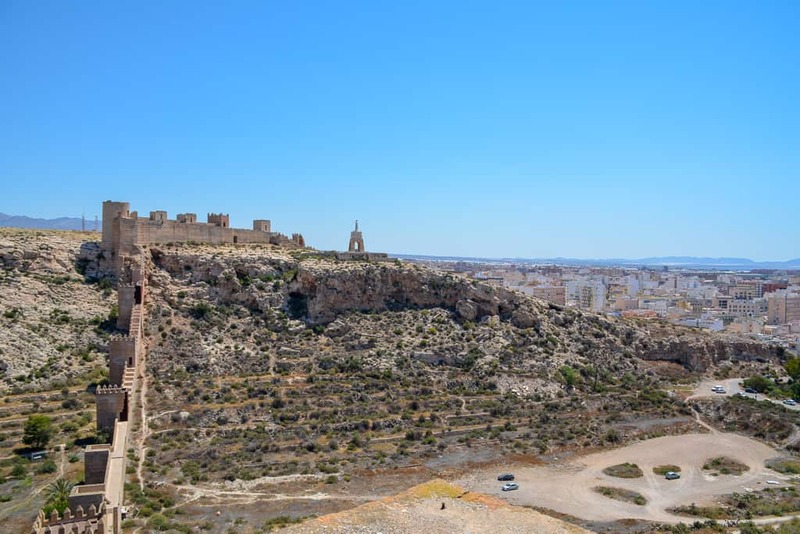 In Almería, the Alcazaba is a towering monstrosity on top of a hill overlooking the harbour and the city. It’s a commanding building, huge in dimensions, and strategically located. The Alcazaba can be divided into three parts. There are the Arab style water gardens which you see first when you enter the complex. 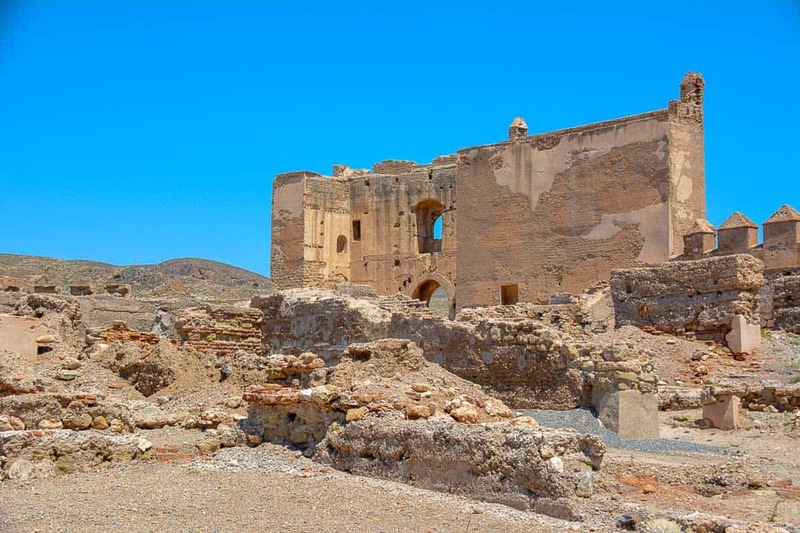 This lower part of the castle used to be the safe haven for the people of Almería in case of an attack. This follows the middle enclosure where Moorish dwellings are actively excavated and researched at the moment. This section was the administrative part of the Alcazaba, where officials and their families lived. 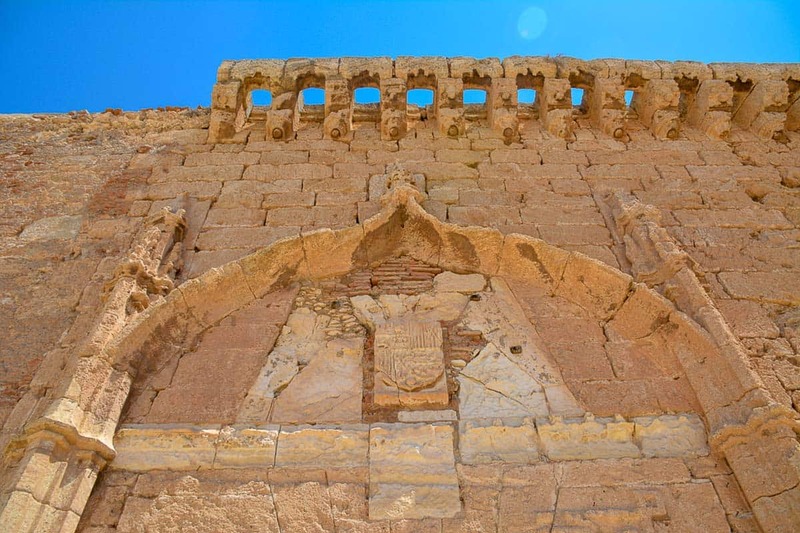 Lastly, you will reach the fortress with its impressive walls, towers, and views of the countryside. This is the proper military part of the Alcazaba from which the Moors were able to control this part of the Andalusian coast. Water is always a welcome sight in Andalusia, in particular on a hot day like this. No wonder that Arab gardens elevate water to become the king of their garden design. 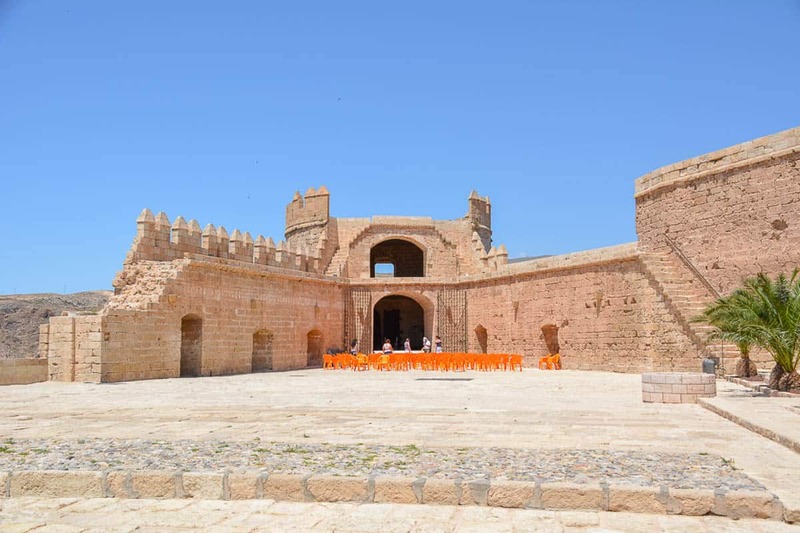 We visit the Alcazaba of Almería with the children. They are semi-interested but because they know that we will move away soon they comply and make the best of the situation. It’s a stinking hot day, and there is little shade as we climb up the mountain to get to the inner parts of the Alcazaba. As EU citizens, we can pass the entrance without paying, but otherwise the fees would have been low anyway. The gardens of the Alcazaba are pretty and orderly. There are fountains and ponds with circulating water, small trees, low hedges. Under our feet, cisterns ensure the constant supply with water. 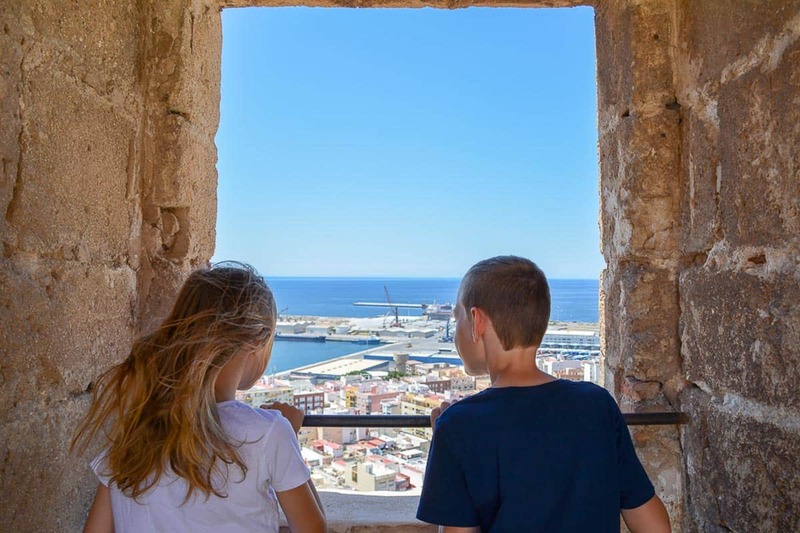 We enjoy the views over the rooftops of Almería from the outer walls, feel the warm breeze from the sea hit our face. Since the gardens are on a rock spur we have views to three sites. On the site opposite of the seaside we can make out the last remains of Almería’s city walls which are closing off the valley behind it. It is the first time that we sense the strength and the power that the rulers must have had over the land here. On the next hill in the distance, we can make out more ruins and a statue of Christ: These are the remains of a Templar castle on Cerro de San Cristóbal. Ruins and 1,000 year old foundations make up the second enclosure of the Alcazaba. Highlight is a set of two houses that you can walk into to see how people used to live here. Stairs lead us further up to the inner parts of the fortress. We are passing a gate and enter the middle section of the Alcazaba. Inside a restored building, we find a vending machine where we get some cold drinks. We pause here for a couple of minutes to cool down. It is indeed a stinking hot day in the south of Spain. After passing through the building we explore some of the ruins inside this inner part of the Alcazaba. There are some signs helping with the interpretation. From what we gather, the partly restored houses in the middle are family dwellings. They are small and humble, but they have inner courtyards and remind us of other buildings that we have seen in Andalusia. As a history nerd, I am thrilled to think that these structures might be up to 1,000 years old. We climb the Muro de la Vela, the tall wall between the lower and the middle enclosures of the castle, and take in some more views. From here we cannot help but notice how different every city in Andalusia looks. 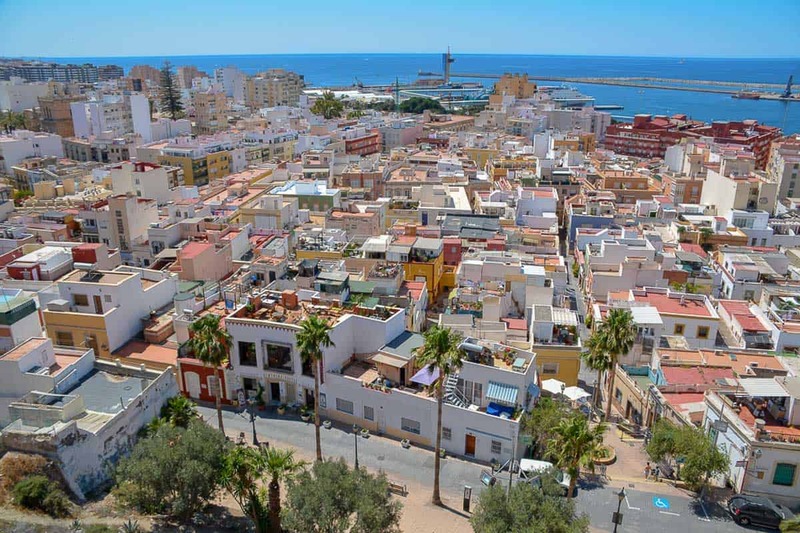 Almería with its predominantly flat rooftops has retained a lot of its Moorish roots and looks very different to the Baroque city centres of other Andalusian cities. Even though Málaga and Almería are on the same coast, just a couple of hundred kilometres apart, there are worlds between the two of them. Malaga’s city centre is mostly Christian and Baroque in nature. However, as we are looking down on Almeria, we can make out the flat rooftops of much older houses – distinctly Arab in style. In a sense, they remind us of Cádiz, while Cádiz still does appear younger and more Christian. Almería is definitely worlds apart from Seville, which has blossomed during the trans-Atlantic trade with South America. We continue on our journey, kids in tow, crossing the limestone ruins of the inner courtyard and into the fortress part of the Alcazaba. Under the hot Spanish sun, the ruined limestone walls look golden. It feels like as if we were in Sahara desert, all sand and blue skies and not much else. The heat is challenging, I will not lie. We hop from scarce shade to scarce shade like criminals that prefer to hide in the dark corners. Exploring the castle in the early summer heat is a challenge for all of us. Luckily, there is a nice breeze coming up the mountain from the sea. The last part of the Alcazaba is set up for a performance and there are orange chairs everywhere. 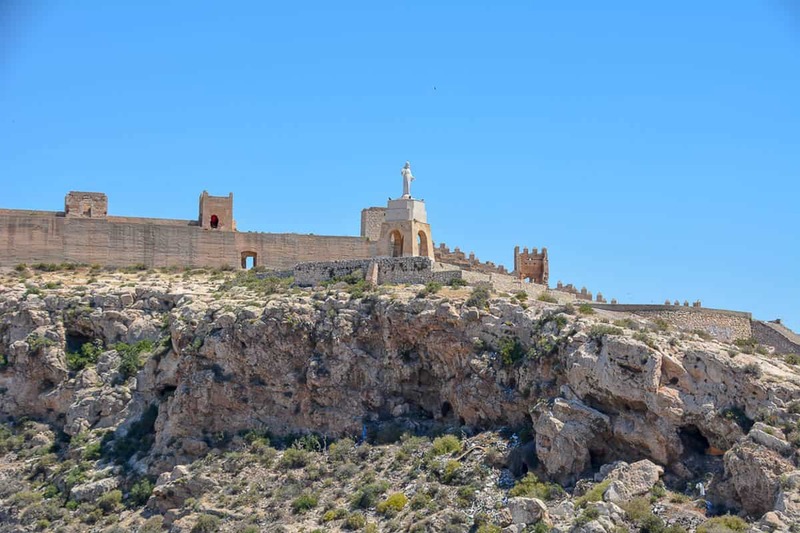 It is the most complete part of the fortress, as it was restored by the Catholic Monarchs after the Reconquista and is thus just 500 years old, not 1,000. Again, we head to the outer walls to take in the views. The kids hang their noses in the warm air that comes from the Mediterranean Sea. On the helm, there is one last tower with canons. As we look out we can see old caves in the mountain side, the Cueva de la Paloma. As the story goes, when the last Moors fled the city of Almería they hid there most precious items in these caves or nearby. The story sounds plausible to us. The Alcazaba in Almería is less complete than other Moorish fortresses in the south of Spain. However, visitors can still feel the sheer size that translated into power. 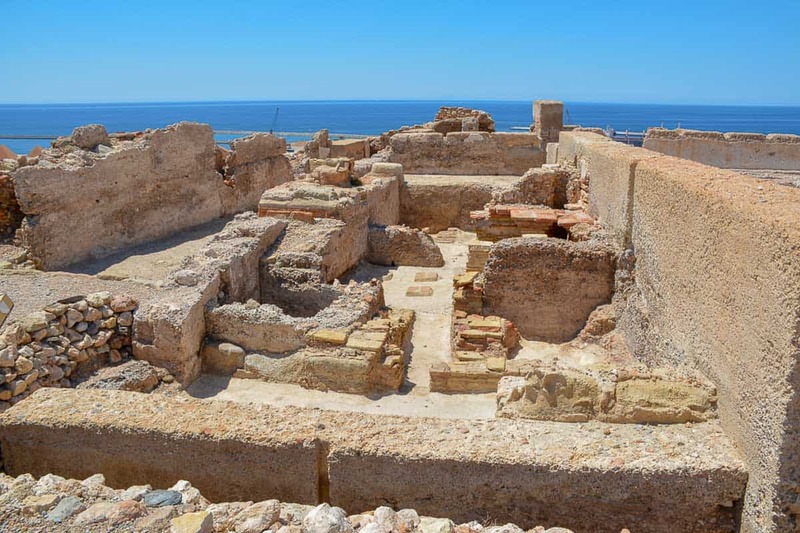 Should you Visit the Alcazaba in Almeria? 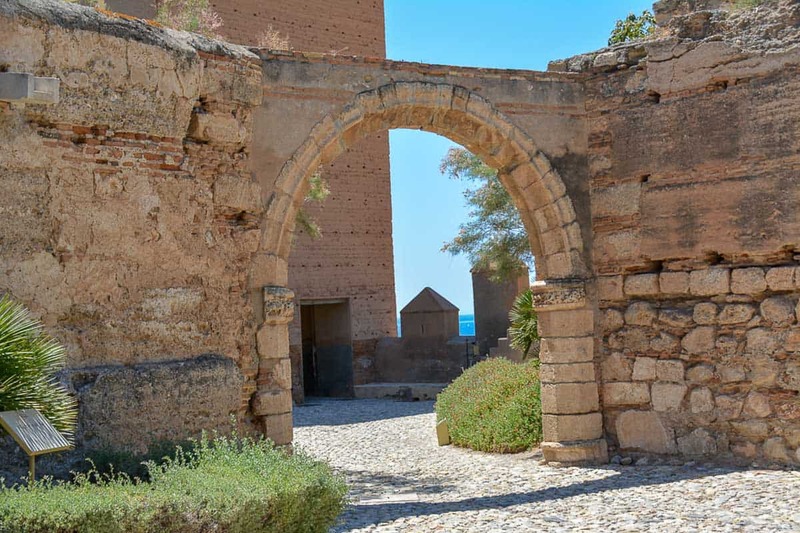 You will read in some Andalusia guidebooks that the Alcazaba in Almería is a worthwhile alternative to the Alhambra in Granada (read our tips here! ), coming second in size. What makes it attractive to many Spain visitors is its location close to the sea and to the seaside resorts. 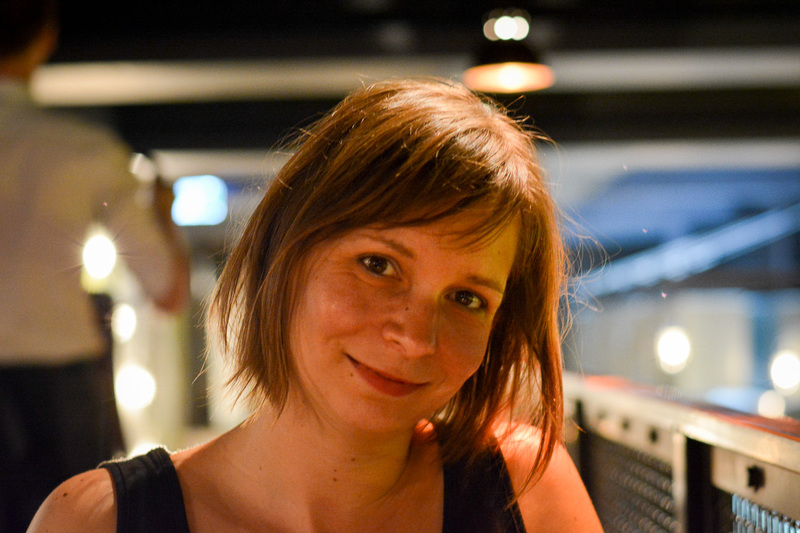 There is also the free entry for EU citizens and the lack of visitors to consider. However, if you compare the Alcazaba of Almeria with the Alhambra in Granada you will soon realise that the two are not of the same calibre. What the castle of Almería is missing is something as beautiful as the Nasrid Palaces that you would find in Granada. The splendour and the beauty of these Arab-style palaces with their plasterwork and intricate architecture cannot be found in Almería. Also, the gardens of the Generalife in Granada are much more elaborate and much bigger than the forecourt of the castle in Almeria. The most complete parts of the fortress are not Moorish but Christian and were built after the Reconquista. Today, the structures are used for events. Still, we found the Alcazaba in Almería a worthwhile experience that we are glad we could visit with the kids before leaving the country. The views are indeed outstanding to all sides. The blue of the Mediterranean, the city walls and the Templar’s castle on the next hill, the flat rooftops of Almería. I also found exciting to see the ongoing excavations on site. I loved to think of the size and age of the fortress overall. 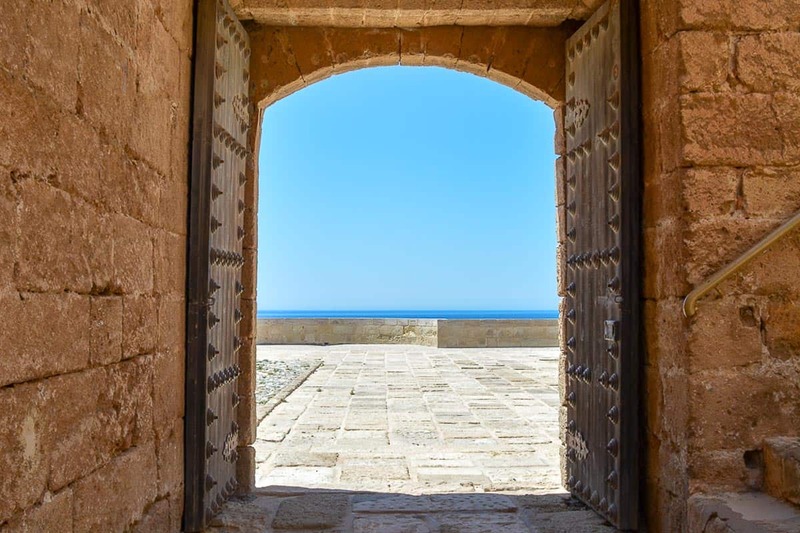 In the end, you will need to make up your mind if you would want to visit the Alcazaba in Almería. Frankly speaking, I would always prefer the Alhambra over the Alcazaba. But for getting a quick introduction to the Andalusian history, this will do just fine. 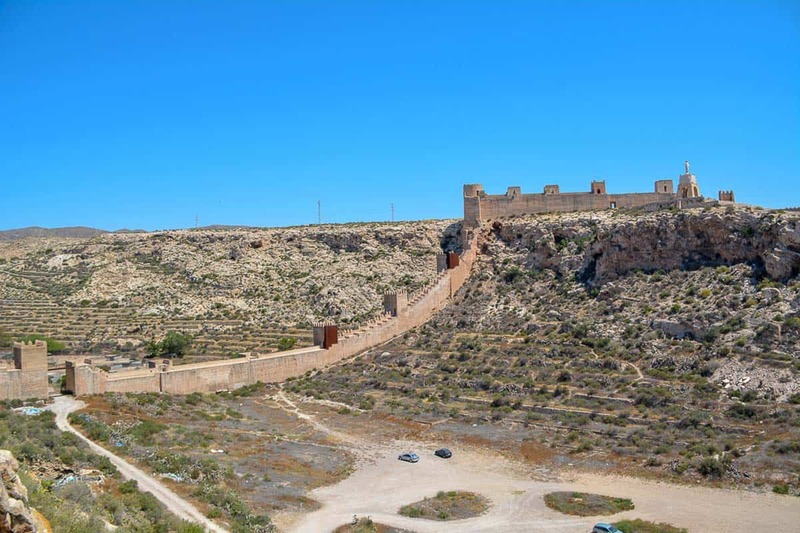 The old city wall of Almería closes off the valley between the Alcazaba and the Templar castle. 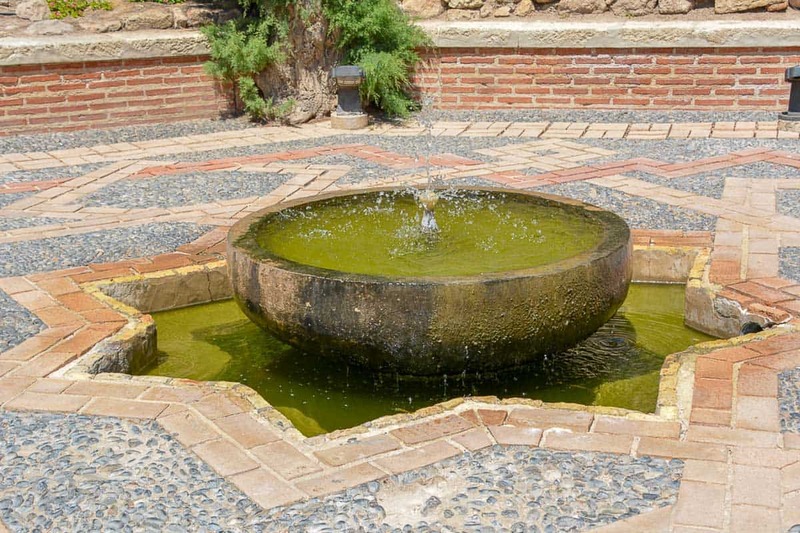 There are some fine examples of Arab-style gardens in the Alcazaba. Little of the original structures has remained but this gate is still there. A lovely detail of the Alcazaba. 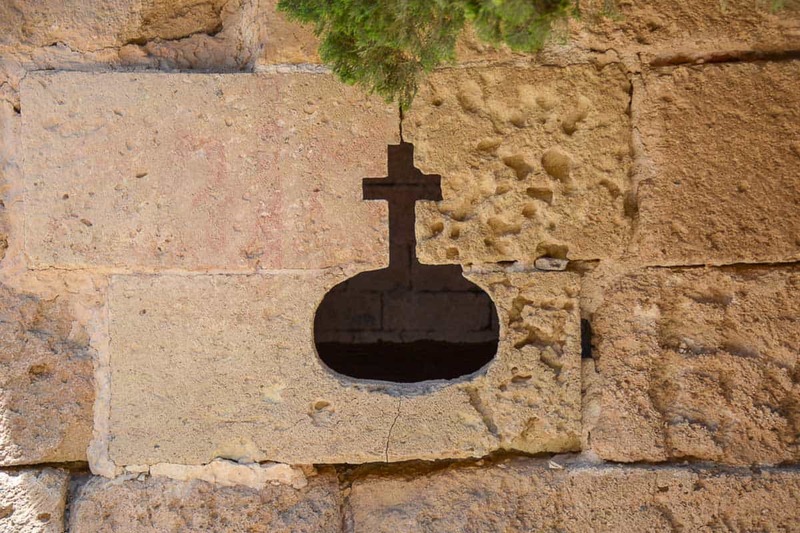 The arrow slits in the last enclosure show the Christian cross. Cerro San Cristobal is the name of the next hill which is connected with the Alcazaba via the city walls. You can clearly make out the statue on top of the mountain. The blue of the Mediterranean like a sweet promise on this blistering hot day under the Andalusian sun. 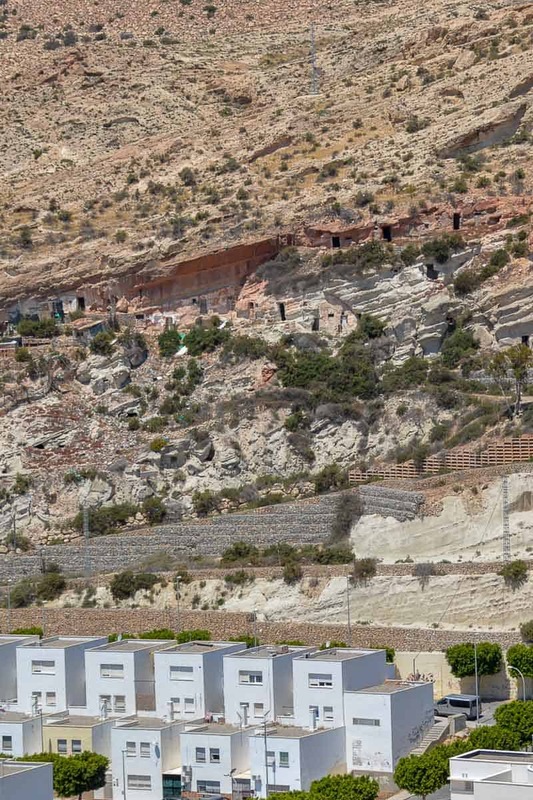 The caves houses near Cueva de la Paloma in Almeria can be clearly seen from above. The story goes that the last Moors hid their treasure in the natural caves after fleeing the city.